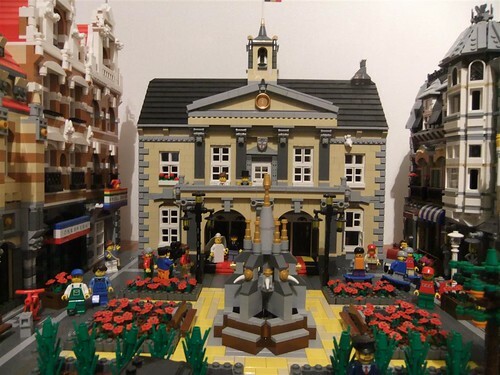 Brick Town Talk: Civil Ceremony - LEGO Town, Architecture, Building Tips, Inspiration Ideas, and more! Downtown Historic District - (BTT) They say that the cost of an average wedding is over $25,000 - considering that financial difficulties are one of the leading factors for divorce, perhaps starting off your new life together with your spouse already in debt it not the wisest decision. This couple has it right - a simple ceremony at the beautiful and historic Town Hall, with the Town Square providing the perfect backdrop for pictures. After all, why spend thousands on flowers when all you could ever want are free to enjoy right here. Great find! I really like that town hall.